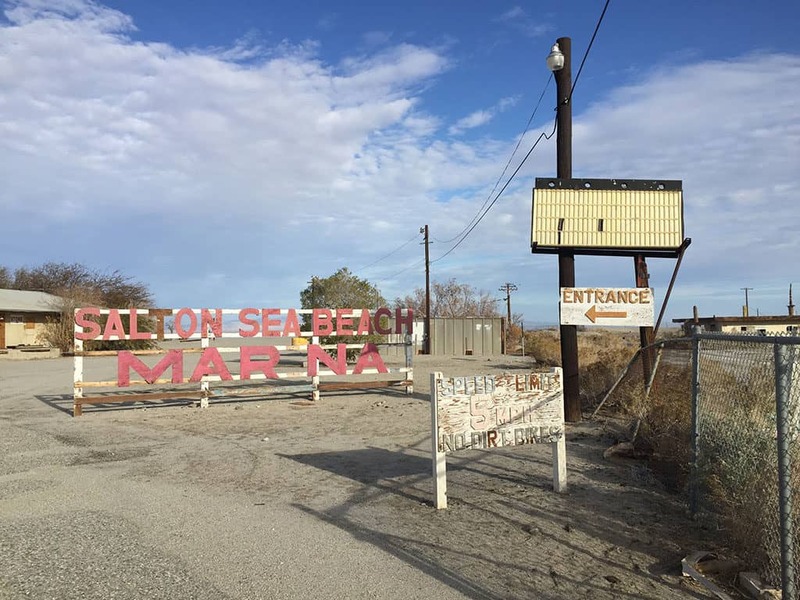 The Salton Sea story is a long one. It ebbs and flows with many victories and defeats. There is a very detailed explanation about its natural history on Wikipedia, I won’t repeat it here. There is a briefer and more interesting version of its cultural history with great vintage photos on the Salton Sea Museum site. The truth is, this place is fascinating. There have been railroad towns, a salt farm, and lake resorts, now it’s just “has been.” I will admit right now that I do not know all the politics around the Salton Sea, but after spending two days there, I see opportunity. 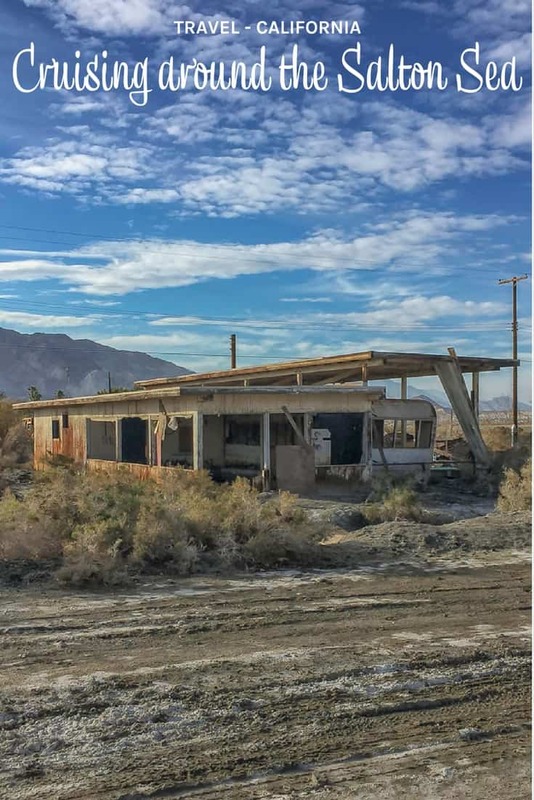 Based on my experiences in Detroit last year, I know that a city is more than just the exploited photos of ruins, but when I drive through the towns of Salton Sea, for the most part, that’s all I see. There are a few shimmers of light where people have rebuilt and it is with those shimmers that I can see whole towns revitalized for tourism. It may just be naïveté, but that is the dreamer in me. I encourage you to visit the Salton Sea area. There are the towns, the ruins, the seashore, the birds, the farms, a lot is happening around this body of water and it is not all bad news. 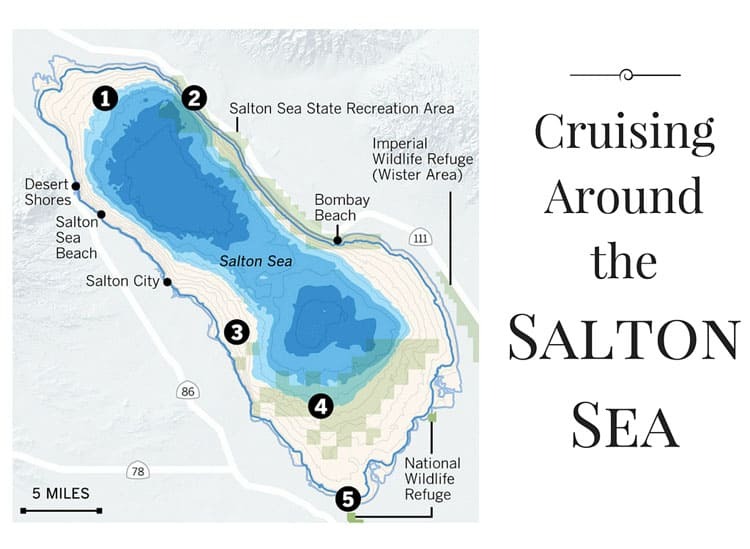 Here are my highlights from cruising around the Salton Sea. Located on the western side of the Salton Sea, Desert Shores and Salton Sea Beach were two major resort areas hopping back in the day. With about 800 people living in this area, it is hard to call them ghost towns, but it certainly feels like one when you are driving through. There once was a beautiful yacht club and marina, but all that remains of that era are street names like Shoreview, Seaview, and Beachcomber. Given that we are riding around in an RV, we are of course interested in the RV/mobile home aspect of these towns and when these spots are rebuilt, they can be adorable. There are lots of homes with an RV or mobile home as its foundation with the rest of the “home” built around it, like decks, additional rooms, and we even saw several mobile homes sewn together. But of course, most of the spots look like this. 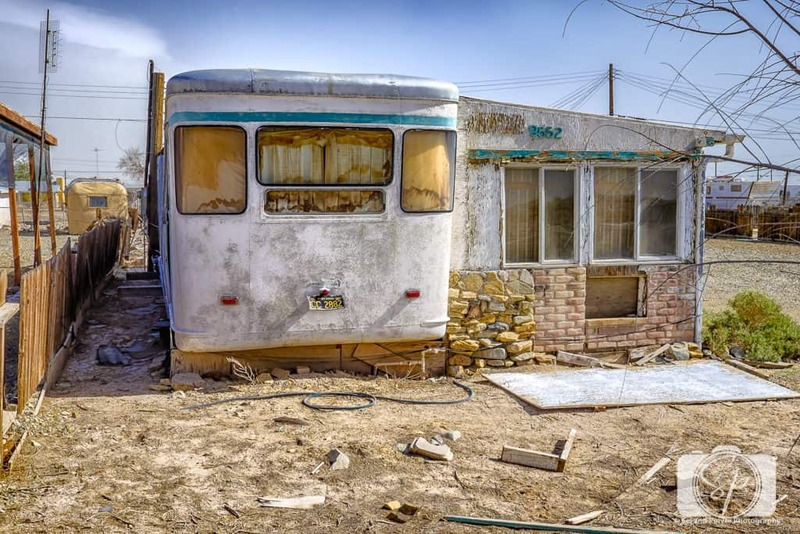 These dilapidated homes make for great HDR photos as Mr. Misadventures will attest to, but all I can think about is how awesome they would look if someone came in and restored these mobile homes to their former prime. Do you think that Justin and Anna from Flippin’ RV’s could move here for a few years and get everything shipshape? Located on the southern end of the Salton Sea, the Sonny Bono Salton Sea National Wildlife Refuge is a great spot to stop and explore. Particularly for bird observation (there isn’t much other wildlife) and hiking. The refuge was created to protect birds resting on their migratory route south. The refuge includes farm fields, wetlands, and tree rows. 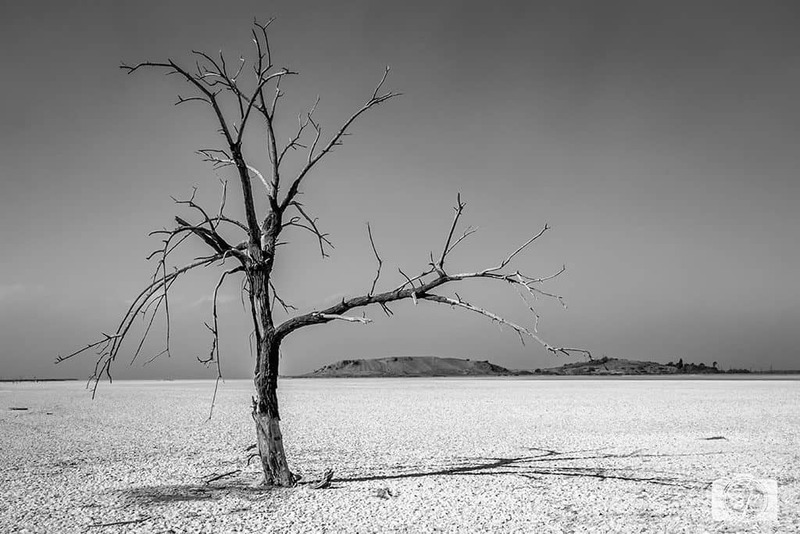 Just outside the main park on the road headed to Niland, you will find an amazing set of three trees standing alone on the salted seabed, it makes for a super dramatic photo, like the one Mr. Misadventures took above. This is a peaceful spot to reflect on how important it is to protect our avian population. P.S. if you have a spouse, loved one or friend who is not a native American, you may have to explain who Sonny Bono is! I connected the dots for Mr. Misadventures by singing “I Got You Babe” and then informing him that the male part of that duo was the man the refuge was named after! 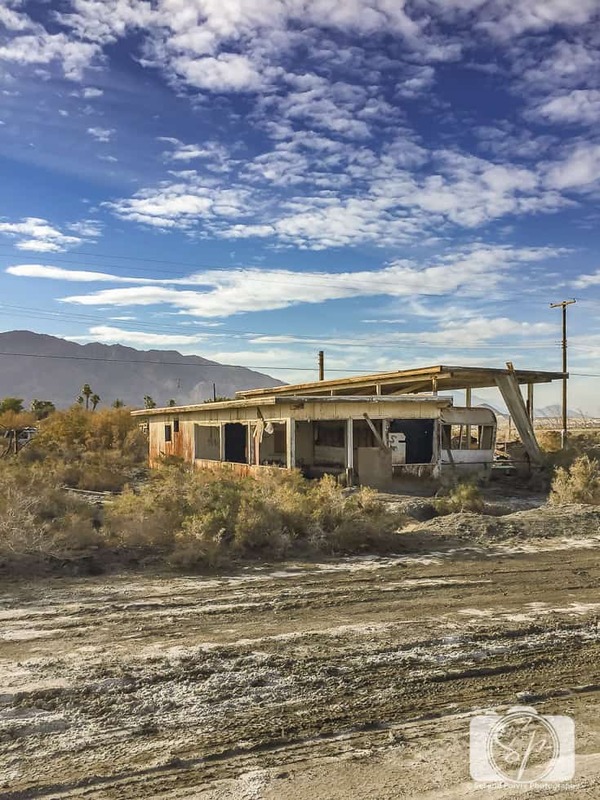 Bombay Beach was the second major resort area on the Salton Sea. 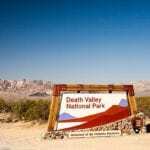 It is also the lowest community (it is not really a town) in America, at 223 feet below sea level. We saw a lot more people here (there are around 300 residents) but not as many updated houses making it look like the vast majority of these folks live in a dilapidated state. There were two businesses (a market and a hotel) that I could see, along with a fire station. We visited twice. The first time during the day to check out the beach. The beach looks gorgeous until you get closer. First, you catch the smell, maybe seaweed that is a little too ripe, but then you start seeing the dead bodies. Lots and lots of dead fish. In Desert Shores or Salton Sea Beach, there was no access to the beach that we could find without trespassing, so it is cool to be able to get to the water, but the price is the smell! We were going to take sunset photos here so we came back a second time, but as we were waiting for the sun to start it’s decent we kept noticing a few men taking swaths on bikes or on foot to observe us. They were sketchy. I am not trying to be discriminatory, but with the amount of money we have invested in photography equipment, we went with our gut and left to find another spot for photos. I have also since read that other photographers warn of problems here after dark. But during the day we felt perfectly safe! Those ain’t shells you’re walking on! We moved up the road to another spot we had previously visited. 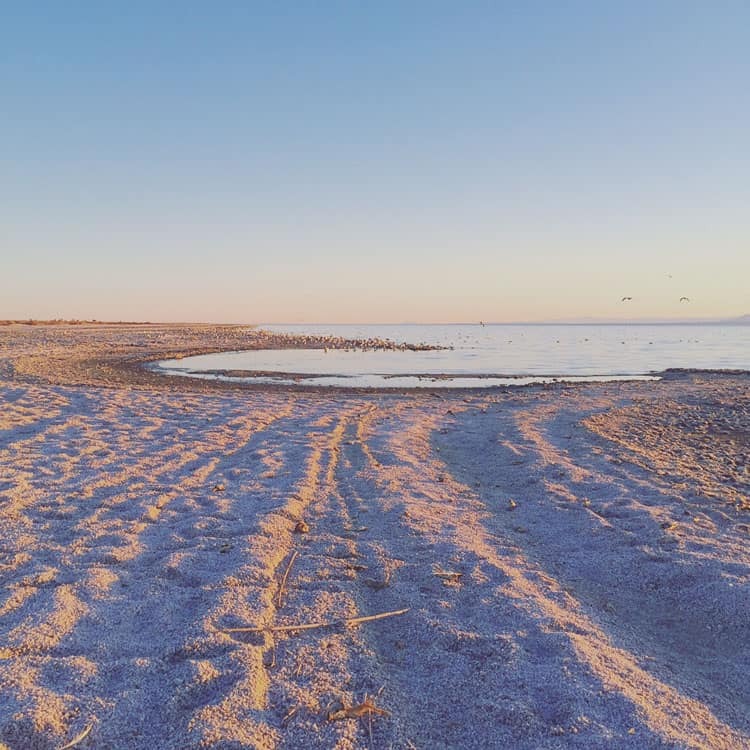 There are several beaches and campsites along the 14-mile stretch that encompasses the Salton Sea, Recreation Park. 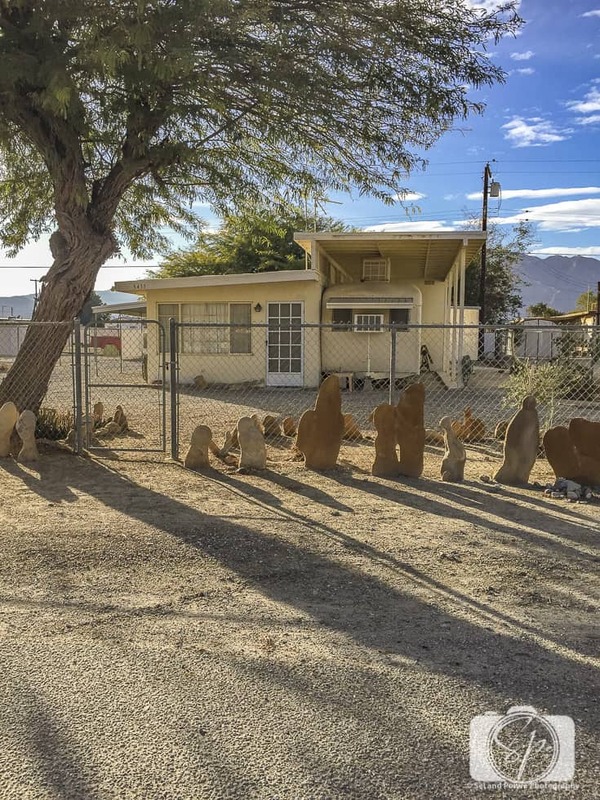 In addition, the Salton Sea museum is not too far. I would have liked to have stopped in, but both times we passed, it was already closed. There were at least six groups of people in two of the beaches we visited, so it seems to be popular, you have to get used to the smell, which I think you do quickly (you’ve seen those Febreze commercials where people don’t notice bad smells…). When we walked down to the beach I thought we were walking on white shells or rocks. Nope. Turns out when you take a closer look it’s fish bones from the millions of decomposed or decomposing fish. Eek! Please note, flip-flops probably aren’t a great idea. I had on sandals and would have preferred hiking boots. This area is a great place to see pelicans, there are dozens and dozens of them. These birds were once endangered but now thrive in this location. I am not really sure how with all the fish dying, but that is mother nature for you! P.S. They have really clean toilets in this park! As you make your way out of the Salton Sea towards the north, you start to see something rather incredible. Farms. After witnessing death, how is it possible that there can be such a vibrant life in the form of food? 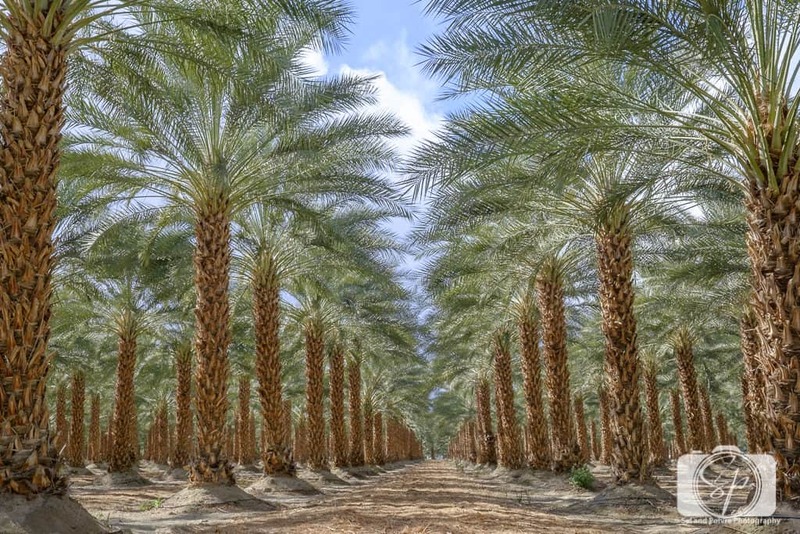 There are citrus groves, vineyards, and dates. Lots and lots of beautiful dates. The trees are gorgeous and there was a little road between two groves that allowed access for us to stop to take some photos. The farms lead up to Mecca, an agricultural town that also hosts the International Banana Museum (go figure?) along with biking and hiking trails like Ladder Canyon and Box Canyon. We didn’t spend much time here, but it is worth a stop, if for nothing else than to hug a date tree! How about you, what do you think? 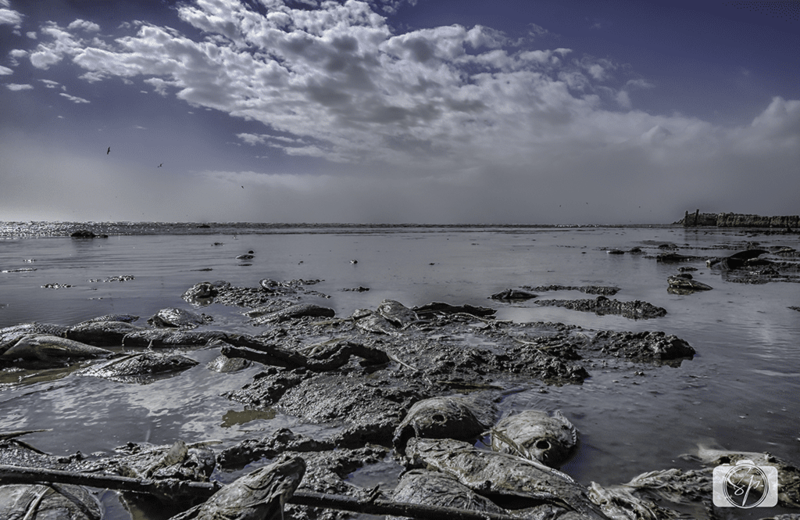 Is the Salton Sea a place you’d like to visit? See restored? Have you visited? Do tell! You’re visiting so many places I’ve never even heard of! 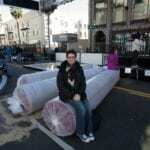 @Kristin, it’s been fun to see things from my hubby’s photographic perspective. He is driving a lot of the spots we visit at the moment. When we get out of the Southwest, the roles will reverse. I know who Sonny Bono is! I hadn’t heard of this area. I wonder why all those dead fish are there. The fish primarily die off in summer when warm water and algal blooms mean less oxygen in the water. The fish suffocate, sadly. I’ve never heard of the Salton Sea. It’s sad to see these relics from the past, isn’t it? I don’t think I could handle the smell on the beach. Hopefully they will find a way to maintain it in the future. I have seen the Salton Sea on TV shows about abandoned places. I would love to visit sometime. @Heather, it really is worth a trip! These photos are amazing! Just goes to show that you can find the beauty in any place. I’ve never heard of this place before. YOur photos are amazing and it looks like a beautiful place to visit. @Dogsvills, thanks, it is a very photogenic place. It’s a shame that someone hasn’t rejuvenated the area. With the area not being maintained, I probably won’t visit Salton Sea. @Beth, there is still hope that it might happen one day. I’ve never even heard of this place before. It looks really interesting and kind of spooky! Love that you found the beauty in it though. I have a soft spot in my heart for dreamers. @Julie, thanks it is a very intriguing place! I love reading about places Ive never heard of! What a beautiful spot! This is one of those places that you would never know exists – it is so gorgeous! Love your pictures! @Adriana, thanks, it is surprising what you discover when you take the time. It’s so cool to see someone covering parts of America that I didn’t even know existed!! I’m glad you listened to your instincts though and left without taking the sunset photos. And that fish bone beach? Ew! But still cool to see! @Katie, a lot of it is driven by Mr. Misadventures, he has a tendency to find really cool places for photography. These pictures make me so sad. I grew up in the Imperial Valley near there. It’s not far from where the big Coachella music event is held. We would spend all day Sundays on our boat. My mom would make food and we would swim and ski and hang out on the water. It was beautiful and the water was clean and cool and slightly salty. The run off of pesticides from the farming is what I understand ruined the water. Thanks for the awesome pictures. In was 9 in 1962.